Located just east of the beautiful San Joaquin Valley, Sequoia National Park is one of California’s most beloved camping grounds. 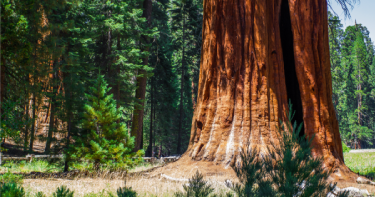 Known for its massive sequoia trees, whose bases can grow up to 40 feet in diameter and over 300 feet in height, the area attracts campers from all over the country to its 14 sprawling campgrounds, of which 10 welcome RVers to set up camp. Activities abound at Sequoia National Park, with a wide range of activities that are sure to appeal to any tastes. Visitors can hike, ride on horseback, backpack, rock climb or join up with one of the Ranger Programs for an interactive demonstration. Explore the breath-taking underground Crystal Caves or kayak down one of the park’s scenic rivers. The winter months also have plenty to offer, as visitors can enjoy skiing, sledding and snowshoeing. If you plan to visit the park in an RV rental, there are a myriad of camping options available. The Potwisha Campground, located just four miles from the park’s entrance, is open year-round. You can choose a site on the fork of the Kaweah River, which has many groves of oak trees. The low elevation of this campground keeps the climate fairly temperate, with plenty of warm weather in the summer months and very little snow in the winter. The Giant Forest area is one of the most popular campgrounds due to the many massive sequoias found here. Lodgepole Campground is open all year round and includes a water station which closes from October to mid-May. The Dorst Creek campground is approximately 10 miles from the Giant Forest and is open to campers from late June until the Labor Day weekend. The Cedar Grove area has a number of campsites, all of which are located in a beautiful canyon near the fork of the Kings River. Campers can choose to stay in either the Sentinel, Moraine, Canyon View or Sheep Creek campsites, which all offer ranger programs in the summer months. Grant Grove has three campgrounds (Azalea, Crystal Springs and Sunset) which are well-suited for RVers as they offer modern restrooms. While only open in the summer months, the shade of the numerous evergreen trees in these campgrounds makes Grant Grove a popular choice. Each campsite in the park includes a picnic table and a fire ring with a grill and metal food storage boxes, although hook-ups are not provided. The park provides a free daily shuttle bus in the summer months that operates along several different routes around the Lodgepole and Giant Forest areas, which is great for RVers who choose to leave their vehicle at their campsite or in the parking lot. The campsites are generally available on a first-come, first-served basis, although reservations are highly recommended for those who want to reserve a spot at the Lodgepole or Dorst Creek campsites. There are no RV hookups available in the parks, but folks who have an RV rental are welcome to use the park’s generators (which are available from 9 am to 9 pm, except at the Dorst Creek and Lodgepole campgrounds, where generators may only be run in the morning time and for a brief time in the evening.) There are several dump stations located throughout the campsites, although the dump station at the Potwisha Campground is closed until further notice. Regarding the length requirements of RVs, the Sequoia National Park has a 22-foot length restriction, and RVers are asked to use the entrance at Kings Canyon National Park, just off Highway 180, when entering the park.